No roar of engines or noxious fumes to distract from the adventure. Drink bar and snack bar available on board. Sail by Alcatraz Island, under the Golden Gate Bridge and see many more of San Francisco's Famous sites. 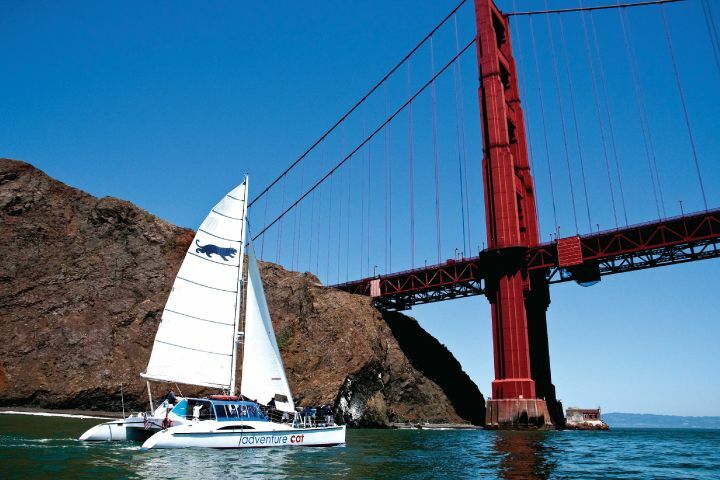 Sail the Bay on our 55’ or 65’ catamaran, the perfect way to experience the San Francisco Bay! San Francisco's Most Exciting Way to see the Bay ! Fisherman’s Wharf : The shopping center and popular tourist attraction was built on a pier in San Francisco. At Pier 39, there are shops, restaurants, a video arcade, street performances, an interpretive center for the Marine Mammal Center, the Aquarium of the Bay, virtual 3D rides, Bubba Gump's, and more. Presidio : One of the more famous of San Francisco's parks, this former military base is operated by the National Park Service of the United States as a part of the Golden Gate National Recreation Area. Golden Gate Bridge : a suspension bridge covering the opening of the San Francisco Bay onto the Pacific Ocean. The Marin Headlands : is a hilly area at the southernmost end of Marin County. The Headlands are famous for their stunning views of the Bay Area, especially the Golden Gate Bridge. Angel Island : is an island in San Francisco Bay that offers spectacular views of the San Francisco skyline, the Marin County Headlands and Mount Tamalpais. Loop around Alcatraz Island : Alcatraz is a smaller island located in the middle of San Francisco Bay in California, United States. It served as a lighthouse, then a military fortification, then a military prison followed by a federal prison until 1963. With an experienced sail guide at the helm, passengers can also have the option to steer the sailboat in calm waters. Or go below deck for a drink in the sheltered cabin. Tours are available in English, German, French, Mandarin, Italian, Portuguese, Spanish, and Korean.